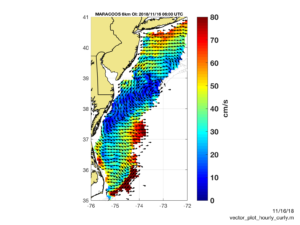 A storm moved through the Mid Atlantic on November 15, 2018. The MARACOOS High Frequency radar network captured the center of the low pressure system as it moved north past Delaware and New Jersey. 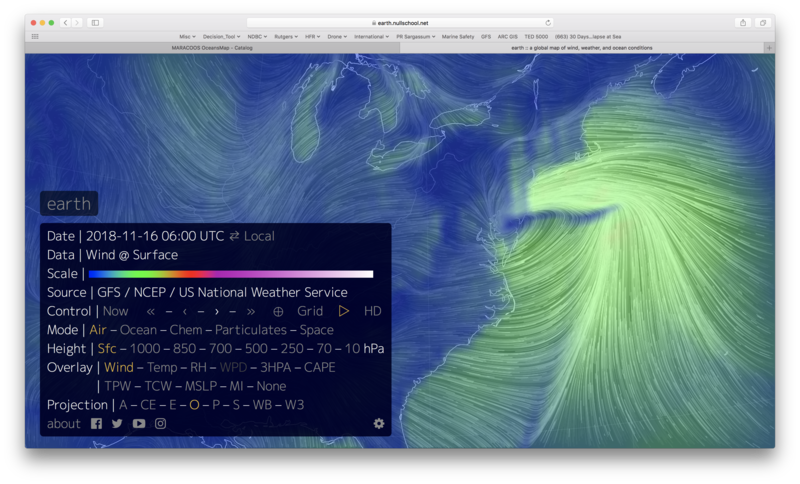 The surface winds from the Global Forecast System (GFS) had the center of the low further inshore. We’ll continue to analyze these two data sets to understand the discrepancy. 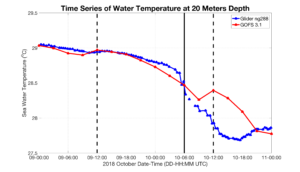 Here is a comparison of the temperature in the upper mixed layer (10 m depth and 20 m depth) at the location of Navy Glider 288. 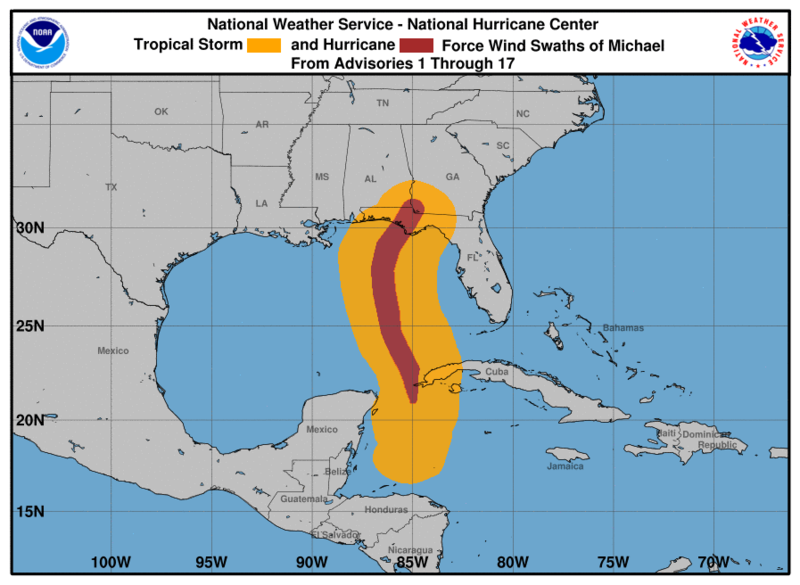 Hurricane Michael passed within less than 50 km of ng288. The swath of tropical wind scale winds was about 500 km wide, so this was relatively close to the track of the hurricane. And the glider was on the right had side of the track, so perfectly placed in the most intense winds. Solid black vertical line is time of hurricane eye passage over Navy Glider 288. Dashed black vertical lines are data assimilation times. 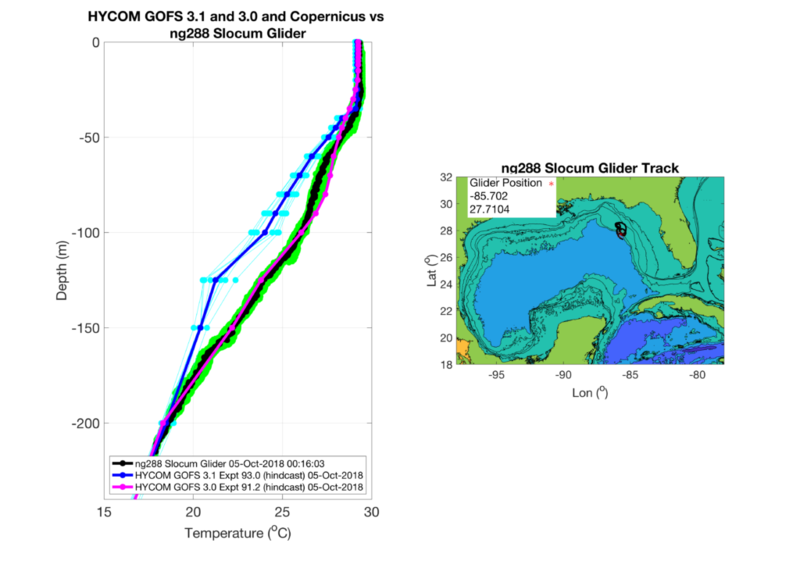 The agreement between the surface layer temperature observed by ng288 and the GOFS 3.1 forecast is remarkable. The model even appears to be cooling the surface layer at the proper rate. Note that most of the observed cooling occurs after eye passage, the opposite of what we see in the Mid Atlantic. The dashed line at 1200 on Oct 10 will be an interesting case to study with our colleagues. We assume the glider data is being assimilated, our friends at NRL are good at checking for this. During this time of rapid temperature change, if glider data from earlier in the day is assumed to apply at noon on Oct 10, it will try to increase the temperature as we observe here. The model then appears to cool the temperature at the right rate despite being incorrectly offset boy about 0.5C. 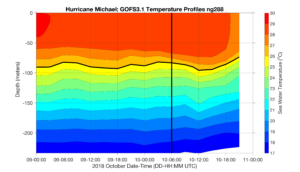 Establishing what happened through the data assimilation during the passage of Michael over ng288 will be a great research question for us to prusue over the winter as we prepare for the 2019 hurricane season. Here we take a time series look at the near surface (2o m depth) temperature reported by the Navy Glider as Hurricane Matthew went by. The time of eye passage is shown by the vertical dashed line. Temperature increase is at one slower rate until about 05:00 on Oct 10, just before eye passage. We then see a more rapid temperature decrease for about 8 hours, most of which occurs after eye passage. By about 17:00 the near surface temperature starts to increase slowly. So three ocean response time periods. Next to check the model …. Below is the same plot as the Glider CTD data but for the Global Ocean Forecast System (GOFS) 3.1 model. Remarkably similar ocean. Differences are in the details. The 26C isotherm here is at a depth of about 90 m. The Navy glider has it at about 110 m, a bit deeper. Surface layer cooling occurs more slowly in the model. We will be looking into those details next. 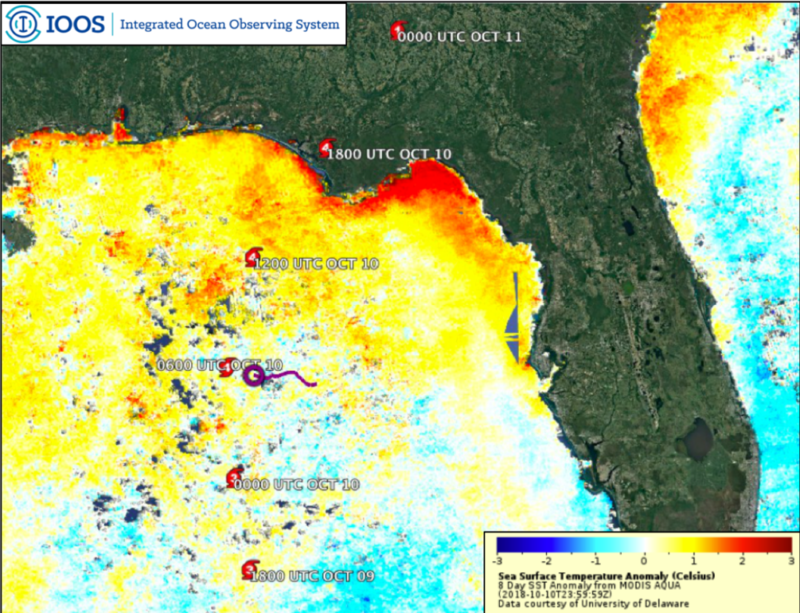 Maria is looking back at the CTD profiles collected during Hurricane Michael as it approached the Gulf Coast. In the figure below we have 2 days of CTD data from October 9 and 10. The 26C isotherm is indicated with a black line. The vertical black line 0n October 10 at 06:00 is the time of eye passage over the glider. The isotherms deepen most rapidly right after eye passage until about 09:00. Surface temperatures over the 2 days start between 29-30C and end between 27-28C. We will look at the time series of temperature at a depth near the surface, like 20 m, soon and get it posted. Navy Glider Temperature and Salinity Profiles during eye passage. 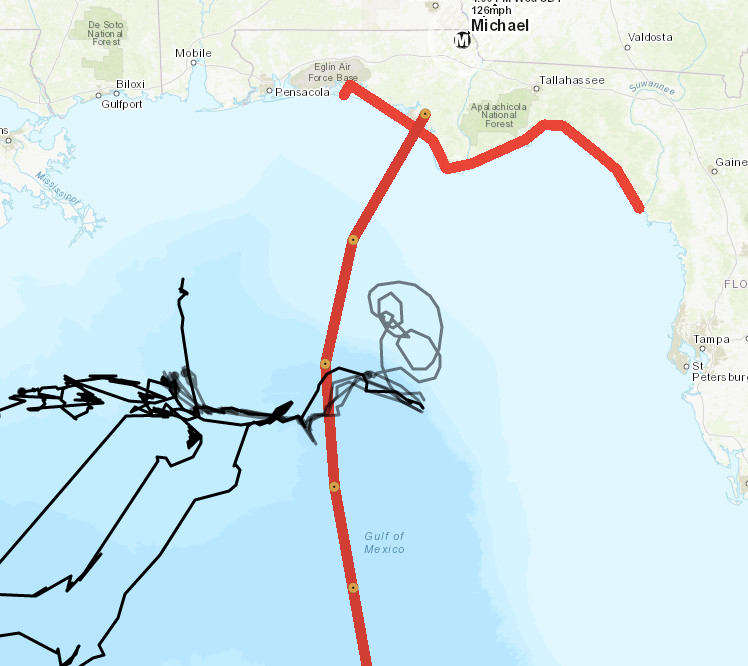 In the previous post, Travis showed the plot of the CTD temperature section from the Navy glider operating just to the right of the path of Hurricane Michael. Here is our first look at the actual Temperature and Salinity profiles that go into that section plot. 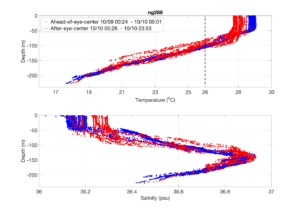 Above we see Maria’s plot of the temperature (top) and salinity (bottom) profiles reported by the Navy glider during the eye passage. Blue is ahead of eye center, red is after eye center. During this time we see a rapid temperature drop of about 1 C, and a deepening of the surface layer from about 50 m to about 90 m. For salinity, we see the salinity of the surface layer increase by about 0.1 psu. 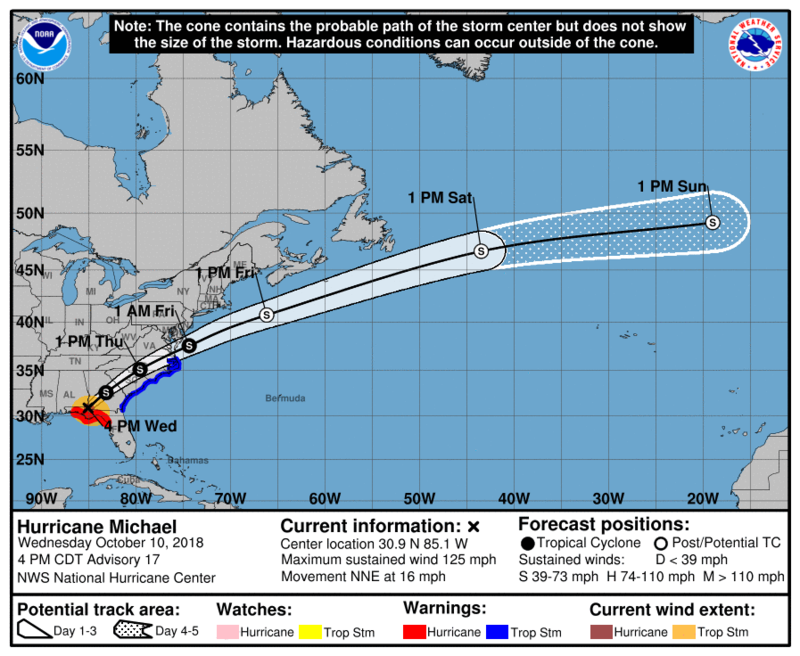 Micahel is now making its way through the Carolinas and into the Northeastern part of the country. It looks like it had a truly devastating impact of the Florida panhandle region coming ashore as a category 4, a few miles per hour shy of a category 5. Some of the rapid intensification is likely due to warm sea surface temperatures in the Gulf of Mexico. Above is a plot of the 8-day composite sea surface temperature anomaly after removal of the 15 year average for the same time period. This product is generated by the University of Delaware Ocean Remote sensing and Biogeography (ORB) Lab. Above average temperatures are clearly visible in the northern portion of the Gulf where the storm intensified. 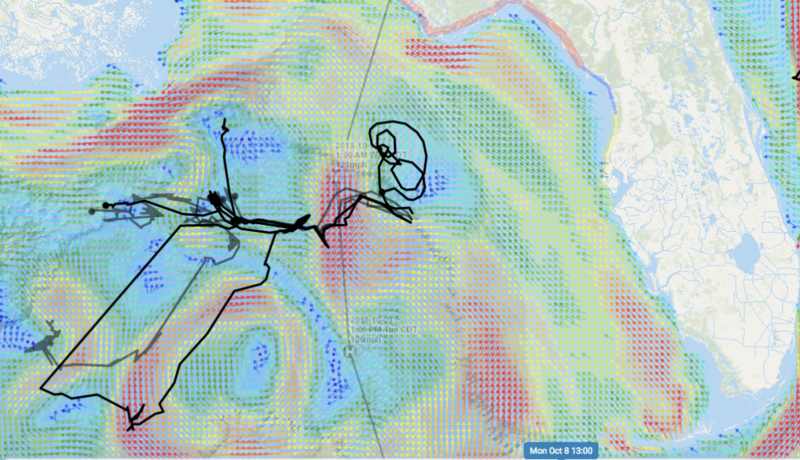 Additionally, this image shows a glider track in purple for the US Navy Glider NG288, which we’ve been following for the past few blog posts. The system collected data throughout the storm, transmitted it to shore where the Navy made it available to IOOS for public release. 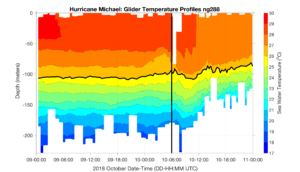 In the time and depth slice from NG288 it’s clear that surface layer was very warm, exceeding 28 Celsius down to about 50 meters ahead of the storm.This thick warm surface layer provided an ample pool of heat to maintain and intensify Michael as it approached land. 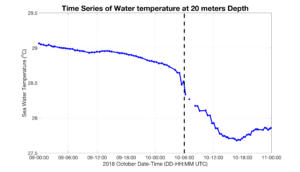 On October 10th, as the storm passed over the glider location there is rapid mixing and deepening of the surface mixed layer from 50 meters down to almost 100 meters, but with very limited ocean cooling. This is an exciting dataset that we’ll be using for years to come to understand rapid intensification of hurricanes in the Gulf of Mexico. Above is our usual cloud top image showing the size of Hurricane Michael after making landfall today in Florida. 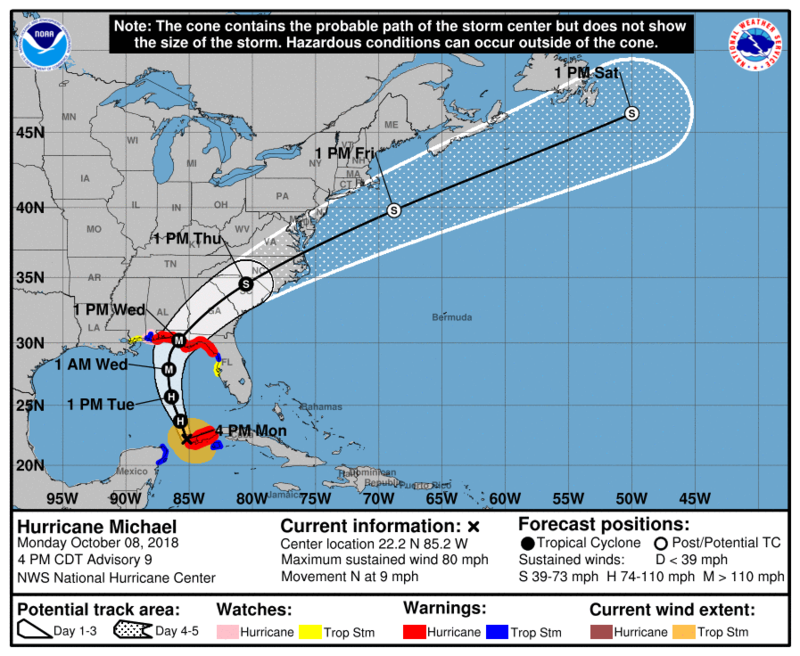 Michael is forecast to take an inland route across the southeast states and cross the Mid Atlantic Bight on its way back out to sea. 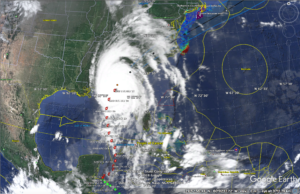 According to the National Hurricane Center Michael has made landfall in Florida as a Category 4 Hurricane with winds just below Category 5 levels. There’s an approximately 500 km wide swath of hurricane and tropical storm force winds across the eastern Gulf of Mexico. Just prior to landfall, the storm’s eye passed within about 50 kilometers of Navy Glider NG288’s most recent reported location. Above are Cross-sections of temperature from (top) Glider NG288, (middle) the Navy HYCOM Global Ocean Forecasting System 3.1, and (bottom) Navy HYCOM Global Ocean Forecasting System 3.0 run by the Navy Research Laboratory. The black contour shows the position of the 26 degrees Celsius isotherm, which is commonly used to calculate ocean heat content for hurricane intensity purposes. At a glance the models have similar surface temperatures to the glider observations throughout the deployment, but the 26 degree Celsius isotherm in both GOFS 3.0 and 3.1 appear to be slightly shallower than the observed position. Next we zoom in to the last days profile comparisons before Michaels passage. The lines and colors are defined as in the previous post, but now we’ve added a vertical line and red triangle indicating the 26 degree Celisus temperature its depth in the glider observations. 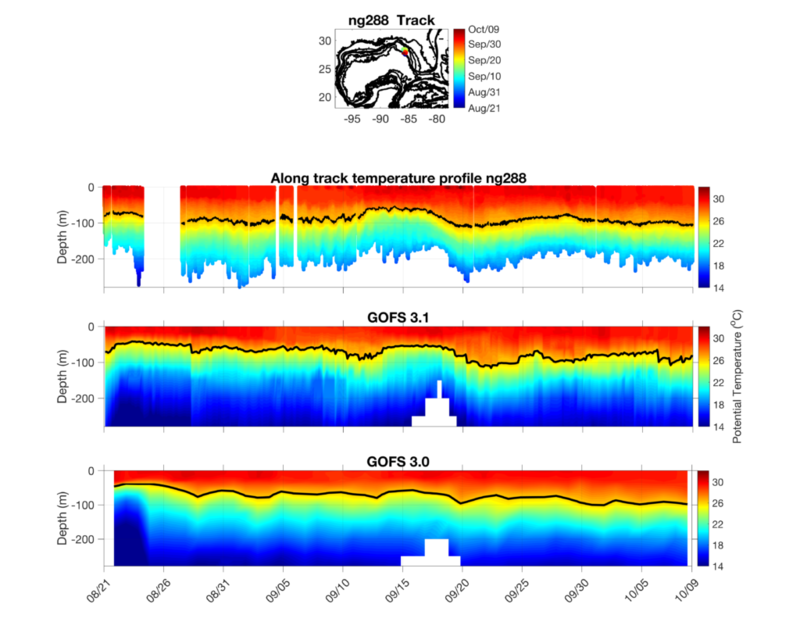 The depth of the mixed layer at 50 meters is well represented by GOFS 3.1, while GOFS 3.0 does a better job of matching the observed temperature profiles below the mixed layer. Maria, our IOOS research analyst, has generated the usual glider data/model comparison profiles for the last day from Navy HYCOM GOFS 3.0 and 3.1. In the left panel: individual glider data profiles are shown in green with the daily mean in black, GOFS 3.0 only archives daily and is plotted in magenta, and GOFS 3.1 profiles are every 3 hours and plotted in light blue with the daily average in dark blue. In the upper 30 meters both GOFS 3.0 and 3.1 are in good agreement with glider observations with temperatures all near 29 Celsius. 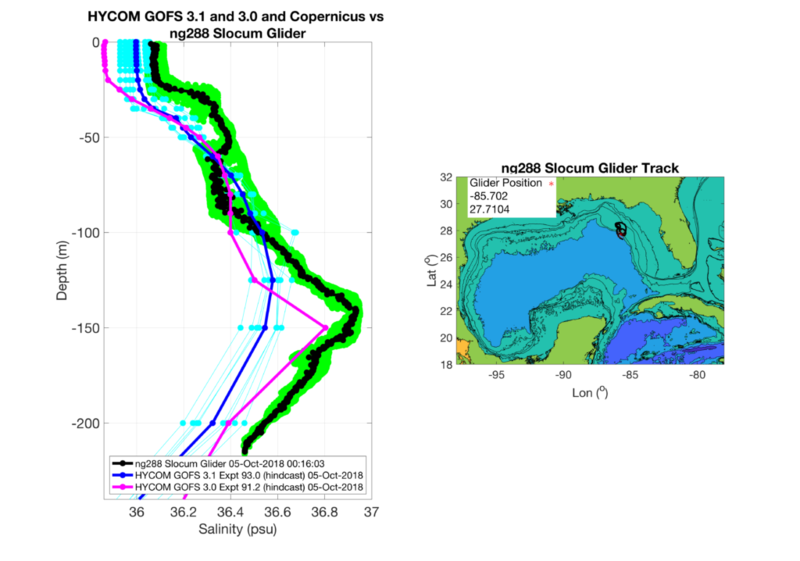 Below 30 meters depth the models diverge, with GOFS 3.0 following the glider profiles closely throughout the water column. GOFS 3.1 remains a few degrees cooler than the glider and 3.0 until about 200 meters depth. The heat content, defined as the depth integrated heat above the 26 degree isotherm, for GOFS 3.1 is going to be lower than the glider or GOFS 3.0. Both models are fresher than the observed salinity profiles throughout the water column, with GOFS 3.1 being closer to observations in the surface, and GOFS 3.0 closer near the salinity maximum at ~150 meters depth. A snapshot of surface currents from Navy HYCOM in MARACOOS Oceansmap shows that a warm core loop current eddy is located just to the west of the storms predicted position at 1:00 PM CDT Tuesday October 9th. The glider is located in a frontal region near the storms predicted position at 1:00 AM CDT Wednesday October 10th, with slow currents to its east and fast northward currents to its west. The uncertainty in model data comparisons may be related to the placement of these features in the different models, and will require further investigation.